Nicolai Sivert Beer(1885-1950) , photographed by Gustav Borgen. 1907.01.18. 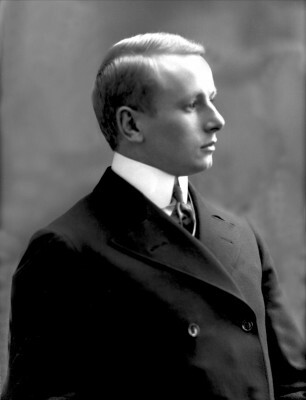 Nicolai Beer opened his own office in Kristiania in 1914. Beer belonged to the avant-garde among Norwegian architects in the 1920s, and was inspired by the development of German architecture. Beer was particularly concerned with simple and rational solutions. 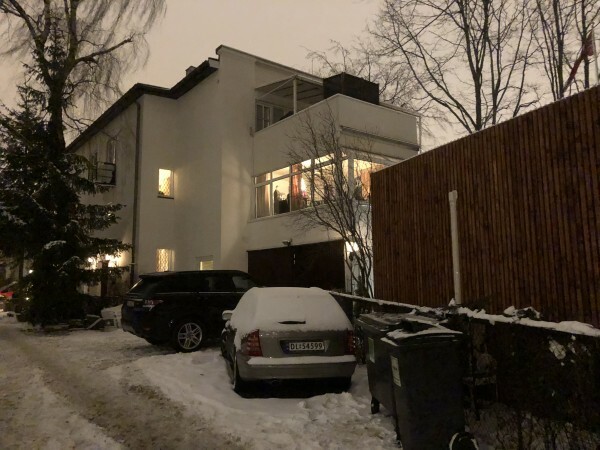 He participated in a number of competitions and received a first prize for Blindern Studenterhjem in neoclassical style, completed in 1925.One of his projects; Professor Dahls gate 24, also neoclassical style, is an early example of townhouses in Oslo. This shows his interest in the conscious relationship with color use, which characterized both neoclassisism and functionalism. Together with Egil Haanshus, he designed the plans for Bislet Byggeselskap on the eastern and north side of the Bislett stadium. 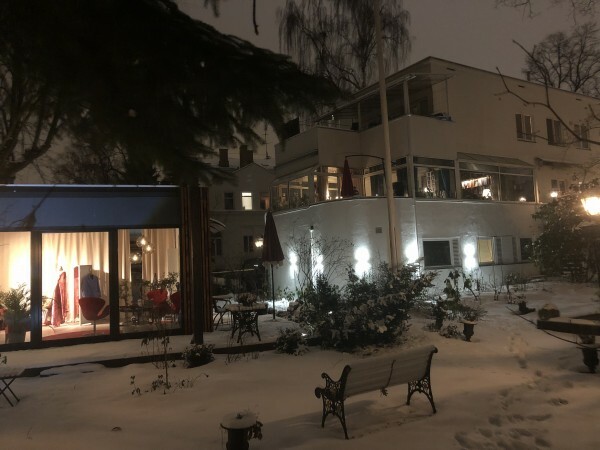 OSLO/NORWAY: Architect Nicolai Beers (1885-1950) beautiful funkis presentation villa at Frogner in Oslo, where the large outer part to Frognerveien, developed with winter garden and terraces, closest to the corner of Frognerveien and Eckersbergs gate. The house and the garden, inclusive many old threes planted around 1895, and with a fountain form designed by Nicolai Beer. The building and the surrounding Høholthus parc, has lately been nicely restored and updated to the beauty of former days, when it was build – 1935-36. 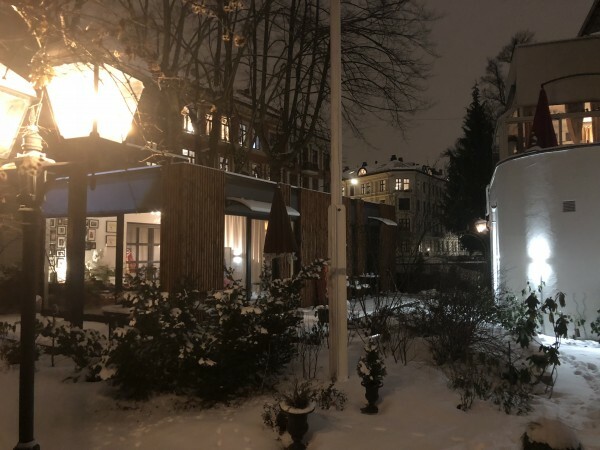 With renewed uplighting in the garden and around the house, it is now a very representative house, who lighten up the whole corner of the streets, and the area to pleasure for the residents in the area and guests and tourists passing on their way to the Vigeland Parc, only four minutes further up the street. 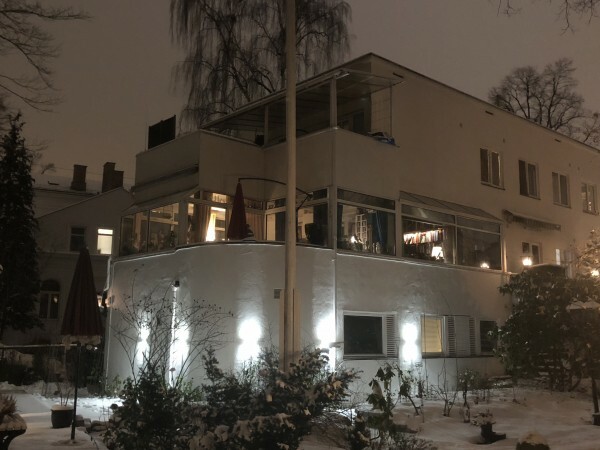 Designer and couturier Tomas Bagackas new build atelier and art studio, placed respectly in good distance from the old functionalist house. Architecturally designed with wood exterior, taking up the ideas and lines from architect Beer´s garage port close by, are through its discrete outfit, and its large glass windows, reflecting the light from the sun, moon, and the lights in the street, who unfortunately is badly lighten up, in this exact part of the street, but through this uplighting of the surrounding threes it change this part to a positive light street part. In the architectural planning of his atelier Tomas Bagackas wished to use wooden sticks around the facades, in the same brown colour as in the surronding threes, in a way which succesfully follow up the original garageport by Nicolai Beer, which still exist in the entrance part. Furthermore the atelier is placed so that it open up the garden part respectfully to underline the Nicolai Beer main building. And is taken as far as posibel up to the fence, in to the entrance part where the houses behind Our house, has permission to passage in to their houses. The building of the atelier and the dispensation, given by Oslo Kommune Plan og Bygg in 2016, follows directly up the Oslo City Boards decission from 2015 to develope the central city parts up the communication spots, as in this part of Frogner, up to the Frogner Square where tram 12 and buss stops 20 gives posibilty to change routes. A further city plan developement in this direction is positive, and after the change in the parking system lately, it is often easy to find parking places in the area, which will be positive also for the many shops, offices, hanwork factories and cafes in the area. The majestic entrance part to Frognerveien 43, where the wood on the atelier is taking up the colours of the trees, and in the form of the wooden parts is continuing the idea that still exist in Nicolai Beers Garage ports. Foto Henning Høholt. Martine Østensen Skalleberg solist på Moulin Rouge.